Same old Far Cry fun. Far Cry 5 has been the biggest release of the year so far. Far Cry is back with a new installment in the popular first person shooter series. 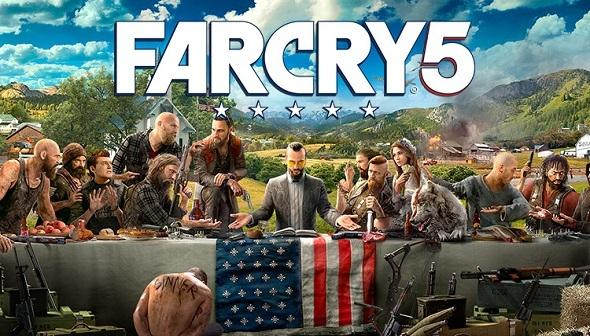 Far Cry 5 takes you into Hope County, Montana, which has been taken over by a fanatic religious cult known as Eden’s Gate. The player is tasked with taking down the Seed family, rescuing their friends, and causing as much mayhem along the way as possible. In terms of gameplay, this is, in my opinion, the best Far Cry to date. Far Cry 5 shines in its ability to let the player be creative. Every day you can discover a new way to take down an enemy or explore the map. The map is my favorite part of the game; though all Far Cry games have been free roam, this is the first game that truly feels like total free roam. Previous games you would have to unlock each new section in the map by climbing a tower and revealing the terrain. Far Cry 5 does away with the system; instead of splitting the map up into three sections each controlled by a different boss, the player is allowed to go in any section at any time and in any order, and once the defeating all these sections they are allowed into the final section of the map to the compound of the final boss Joseph Seed. This game also allows you to have allies including pilots, gunners, and even a cougar and a bear. Simply, traveling around Hope County and wreaking chaos is when this game is the most fun. “The game was really fun because the map is really big and there’s a lot of different things you can do. Personally one of my favorite things to do is go fishing because it kills time and you can break state records,” says Far Cry fan Jeremy Pe. One of the most important aspects of the Far Cry game is the villain. In this installment, the main enemy is a religious cult known as Eden’s Gate, led by Joseph Seed. At first I was very excited with Seed, as the opening sequence is very tense and he comes off as very creepy. However, as the game went on Seed’s crimes didn’t horrify and disturb me as much as villains from past Far Cry games like Vaas and Pagan Min. I think Ubisoft has had trouble living up to expectations after the incredible villain Vaas from Far Cry 3. Vaas is regarding as one of the most interesting and terrifying video game villain to date and Ubisoft hasn’t been able to replicate him since. Joseph Seed wasn’t a bad antagonist, he just wasn’t quite as intriguing as I had hoped. As far as multiplayer goes, the game is less successful. The two player co-op mode is fun as always; joining your friend and playing throughout the story or just adventuring around the world is great. However, the newly introduced Far Cry arcade is a mess. Far Cry arcade allows players to create and play levels created by other players. Though this concept sounds great, the level editing system is difficult to use and most levels are very poorly made. Ubisoft themselves did not create any levels themselves, either, leaving all the responsibility on the player base. When playing with my friends, the levels felt very clunky and unfinished. Overall, if you were expecting a complete overhaul of the Far Cry style with a groundbreaking story, then you may be disappointed, but if you were a fan of previous Far Cry games or open world shooters, chances are you’ll love Far Cry 5.